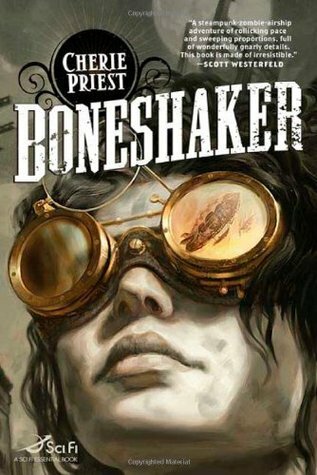 Boneshaker is a typical atmospheric steampunk novel by Cherie Priest. In 2009 the book was nominated for a number of prestigious awards and in 2010 won the Locus Award for Best Science Fiction Novel. The book’s plot is grounded on the alternate history created by the author. It is an absolutely fictional story with some links to the real one; this is what makes “Boneshaker” absorptive, rather unusual and categorically not a soggy book. A storyline begins from the description of the outward things. The 19 century. The Gold rush started much earlier, than in reality. Thousands of gold diggers threw themselves to treasure-troves of the Klondike. At the same time Russia realises than Alaska is a real gold-mine and announces a tender process, a contest to create a perfect drilling machine. It must be safe and high-powered enough to break through permafrost to the royal mines. As a result, that spurs technological progress, but the Civil War has been delayed for 20 years. Hundreds of inventors are trying to create an ideal mechanism but only Leviticus Blue is prove to be skilled enough to construct such one. He apocalyptically calls his creation – an absolutely breakthrough drilling machine – Boneshaker. But during the engineering of the machine he makes some catastrophic mistakes and, when Boneshaker is testing for the first time, it run out of control and ruins half of Seattle. Even worse, through the appeared cracks exposes unknown venomous gas, that turns people into walking deads. The States are in the war and the government cannot propose something better, than build an enormous impenetrable wall around the city. In 20 years the son of Leviticus Blue arrives to Seattle, looking for his father or at least his remains and tries to understand, what happen at that luckless day.